Well here we are at Sunday again and me whining about not being ready for the weekend to end. What else is new? But it was a wonderfully fun and long weekend celebrating my mom’s birthday all day Saturday with lots of shopping, dining out, and me almost adopting another chihuahua at a rescued animal adoption event. I could easily be a crazy cat and dog lady if I had the time and money, I just want to do everything for abused animals. But I had to remind myself my time has been too limited with work to care for another pet – heartbreaking. I need to win the lottery so I can build my own animal sanctuary. But enough of my dreams, how about dessert? Today we had a blast at another huge family birthday gathering for my niece. 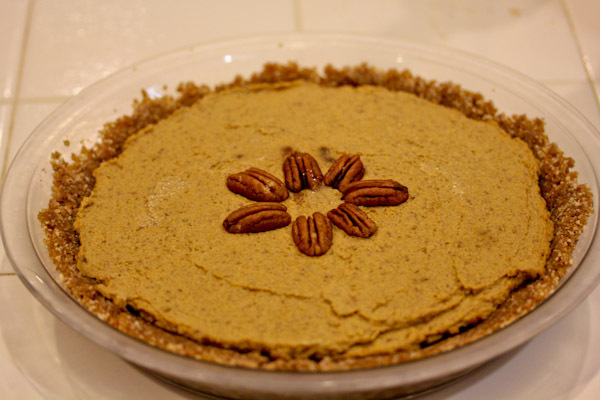 A fall birthday party is a great excuse to make my favorite raw vegan pumpkin pie recipe. 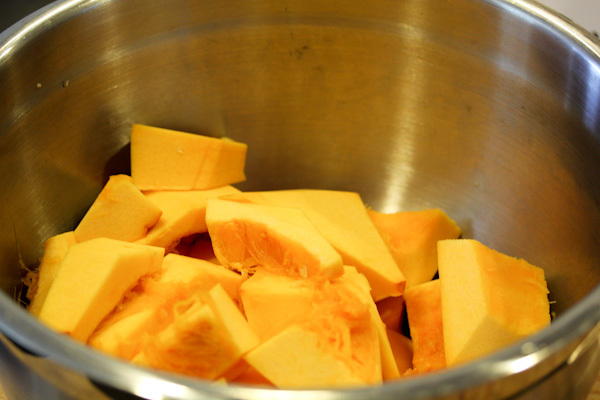 I love being able to take a whole, raw pumpkin and turn it into a fresh and fabulous dessert in minutes. With the help of a good knife and food processor of course. It took me about 10 minutes of chopping, skinning, and seeding to turn a little pumpkin into a bowl of chunks. 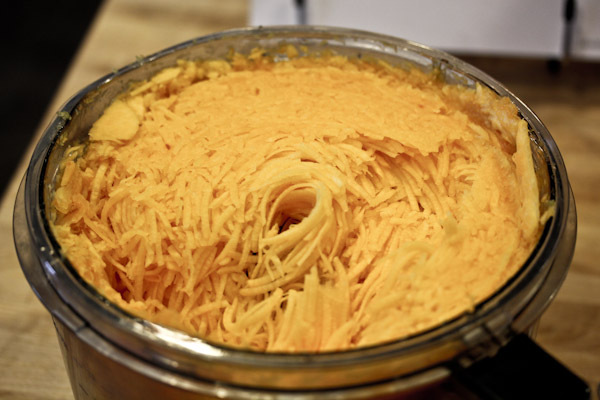 Then I ran the chunks through the shredder blade of my food processor to create a lot of shredded pumpkin – about 3 times more than I actually needed for the pie. I froze the excess for pumpkin pie smoothies, yum! Then switched to the S blade to create the pie filling with the fresh pumpkin. 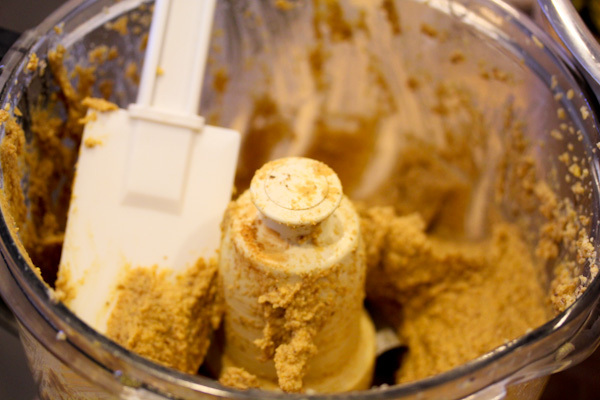 Washed the food processor only to dirty it again for the crust ingredients – whew! But the pie is totally worth the effort. The finished product came out pretty nice looking with the crumbly crust and thick filling. I love the rustic, fall look of the pie. Unlike the neon-colored sheet cake served to the kids at the party, this dessert looked like a celebration of natural, whole ingredients … which it is. 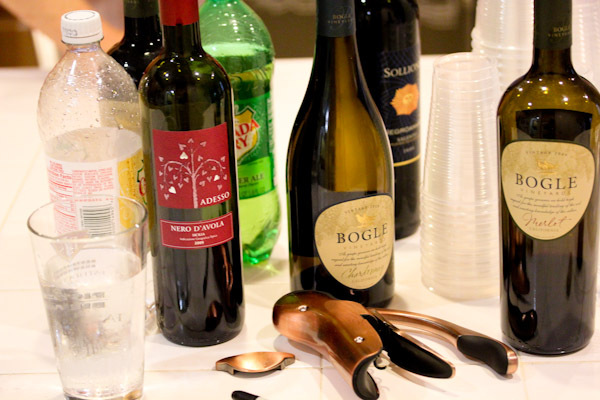 It wouldn’t be a family party without plenty of adult beverages. 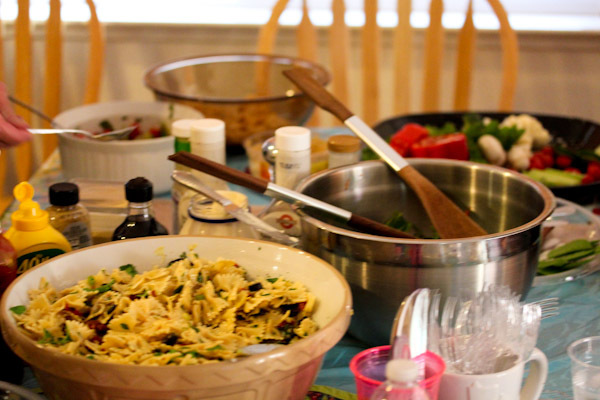 And tons of food, major overkill going on here! 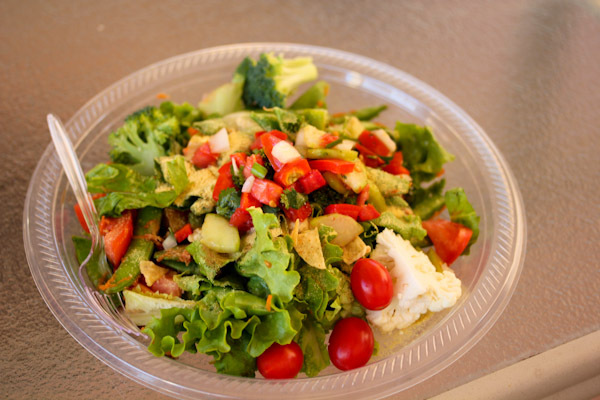 Since I snacked on hummus and fresh veggies, I assembled a huge salad for my main course topped with salsa and veggies from the appetizer table, nutritional yeast and miso dressing. 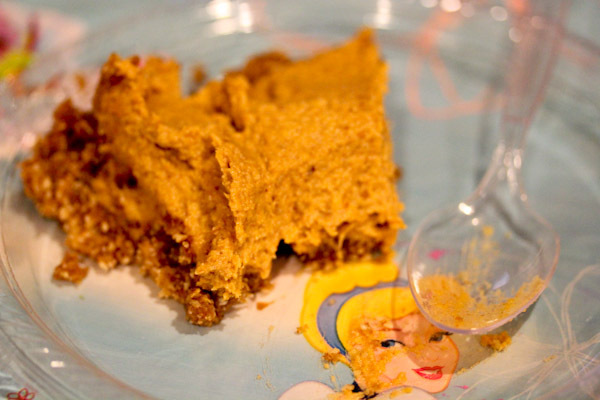 But I had to save room for raw pumpkin pie for dessert served in class with a princess-themed plate. The pie was wonderful, a rich and creamy treat for fall and a perfect way to enjoy pumpkin in it’s purest form. The pie filling texture is more like a pumpkin pie custard and would make a great raw pudding by itself. 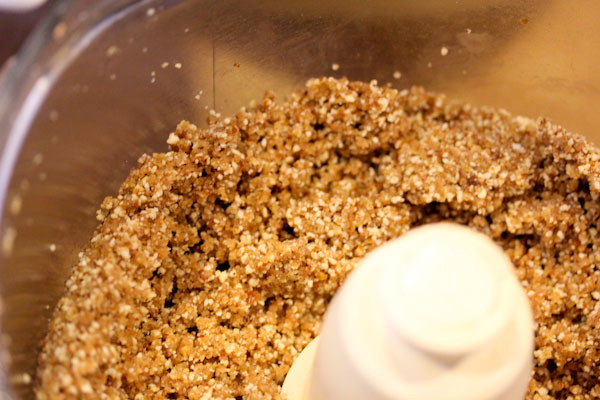 It’s pretty easy to make with a good food processor and a fall tradition for me. 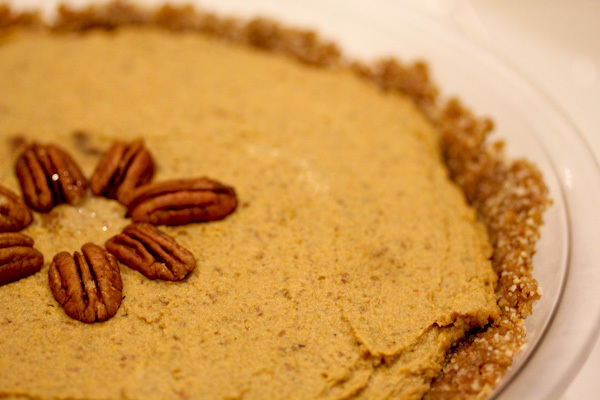 If you’re looking for a great vegan pumpkin pie, give this recipe a try. Now I have about 1,253 pictures of kids whacking pinatas to go through. how did others like the pie? mocking gets so old. blah. 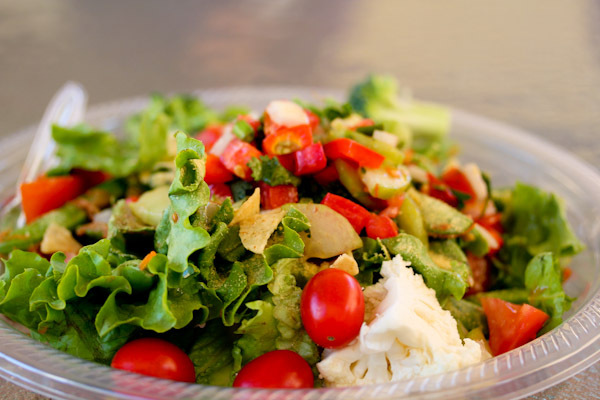 but how do you get your protein??? Ugh, so true on the protein question, I got it again at work last week. this pie looks wonderful, wow!! amazing. 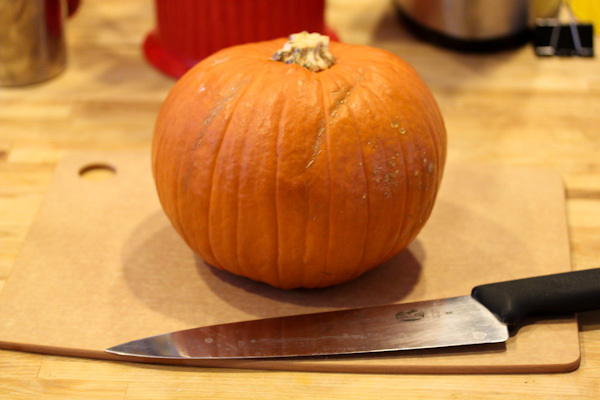 Raw pumpkin can be a bit…daunting, I think. But clearly you made it amazing. Off to check that recipe next. Crazy pet lady, eh? Well before Skylar we had 3 adult dogs, then puppies, and 2 cats. Yeah. Lately I have a “want to get a pet” craving but it’s not practical for us right now to have more animals so like you, I wait. Thanks on the pie, working with a raw pumpkin was not as bad or time-consuming as I thought. And wow, you did have a lot of pets, that’s great. We probably could add another dog down the road, but I want to make sure hubby picks the next one since he’ll be spending more time with it. I love the 4S! The camera is so much better, apps are mush faster, Siri is a lot of fun, and the screen is beautiful compared to my 3GS. Also RunKeeper seems to work much better on it, the GPS syncs up instantly after launching it which used to take a minute or two on the old one. IOS5 is awesome too and it did okay when I installed it on the 3GS before upgrading, like the new message center. I am VERY impressed that you made that pumpkin pie from scratch!!! Hi and welcome! 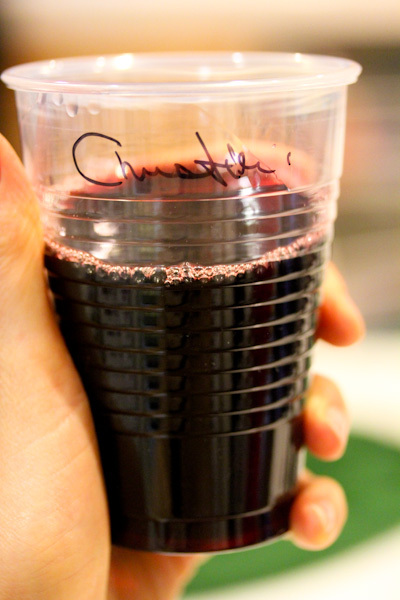 Glad to have found your blog too! :-) I adore chia seed pudding too, it’s so versatile and fun to “brew” into a tapioca-like texture. I love blending hemp or almond milk with a banana and cacao powder before mixing with the chia seeds.